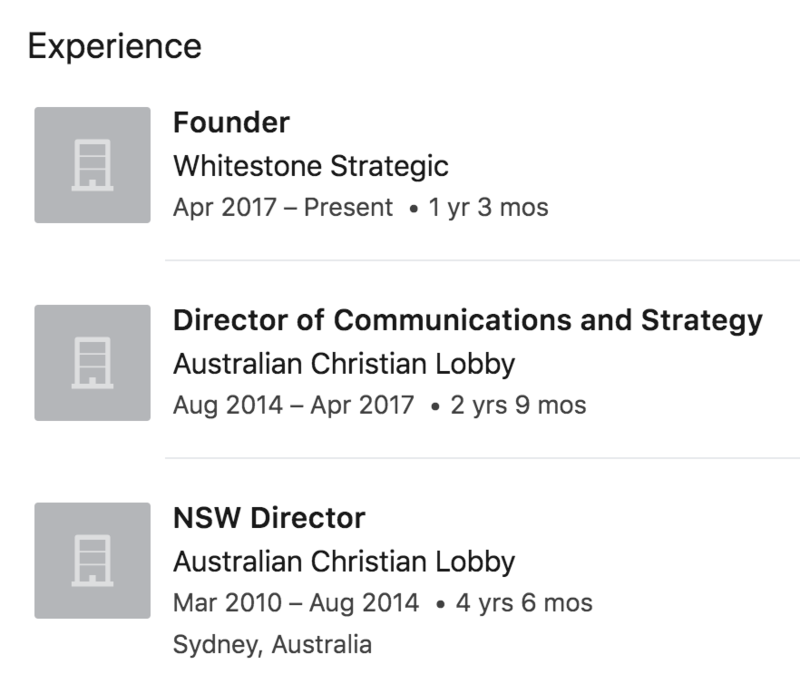 Whitestone Strategic, Perimeter Guardian and the Australian Christian Lobby are all closely connected. Controversial Canberra Liberals powerbroker Tio Faulkner has quit his position in the office of ACT Opposition Leader Zed Seselja. Mr Faulkner recently resigned his position as director of electorate services but will stay on as ACT party president. A second powerbroker, Stephen Doyle – Mr Seselja’s chief-of-staff, brother-in-law and Canberra Liberals campaign manager – has also left the ACT Legislative Assembly after he opted out of a contract renewal. The exodus may stoke speculation Mr Seselja is contemplating a federal tilt in the 2013 poll. Perimeter Guardian informs, empowers and protects school communities from the risks arising from new and emerging technologies. We provide daily information to school leaders on the latest news relevant to the education sector. We also provide leaders with information on their school’s online profile by constantly monitoring social networks, blogs, forums and other inline sources to identify items of risk and opportunity for each school. We empower parents and school communities to support and protect children and families from technological risks by providing information on technology issues that concern parents. We protect students by providing early intervention and prevention tools that complement a school’s pastoral care team. The SafeGuard online reporting tool enables young people to report issues such as cyber bullying, self-harm or other dangerous behaviour they see their peers demonstrating. This assists schools to be able to better support the young people in their care. The Catholic Weekly: So you think you’re friends with your kids on Facebook? 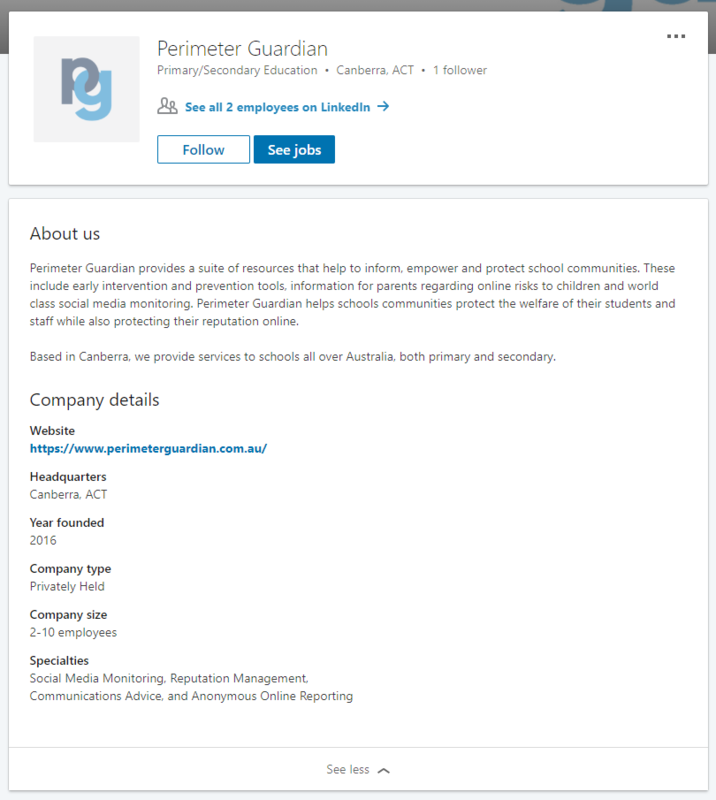 Compiled by Perimeter Guardian a technology-based company that provides protection to school communities across Australia. It partners with schools to provide protection particularly in the areas of new technologies and cyber safety. Jim Wallace AM left the Army as a Brigadier in late 2000 after a 32-year career which included command of the SAS Regiment, Special Forces, and the Army’s mechanised Brigade of 3,000 personnel and most of the Army’s fighting vehicles. He is a graduate of Duntroon in Canberra, the British Army Staff College and the Australian College of Defence and Strategic Studies. Mr Wallace served as a UN Observer in the Golan Heights and Lebanon with the United Nations Truce Supervision Organisation. In 1984 he was made a Member of the Order of Australia for his services to counter-terrorism. He has been a Visiting Fellow at the Australian Defence Studies Centre and has served on the Council of the Australian Strategic Policy Institute and the National Consultative Committee for International Security Issues. He was the Managing Director of ACL for 13 years until May 2013 when he was appointed Deputy Chairman. He was appointed Chairman in November 2015. David Burr is a lawyer and businessman. Together with his wife May Wan, David has practised law in Melbourne for over 30 years, chiefly in the areas of property and commercial law. He has a strong commitment to social justice and the role of the Church in achieving fundamental human rights for all. David is committed to the work of ACL in upholding biblical values in public policy, and the protection of our Christian heritage. In addition to legal practice, David has also pursued a number of business activities. These include property investment and development, a manufacturing and distribution business, and mixed agricultural production. After graduating with a Bachelor of Arts in Public Policy, Michelle Pearse stepped into the role of WA Director for the Australian Christian Lobby where she quickly earned the respect of the most senior personalities in both the church and government in WA. With a growing young family, Michelle moved into a more focused role, dealing with the area she greatly contributed to in her role as WA Director, the fight against prostitution and human trafficking. Michelle was the spokesperson for ACL on these matters across the nation. Michelle and her husband John are both employed at Kingdomcity Perth, a thriving Pentecostal church that is committed to impacting our nation through the love of Christ, socially, economically and politically. Michelle also lectures at Kingdomcity Perth College to give students greater perspective on national issues and encouraging them to be positioned to make a positive impact and create change. Michelle serves on the board of Teen Challenge WA and has a strong desire to see Christian organisations remain Christ-centred in all of its functions. Lyle is a journalist by profession, initially working in rural journalism as a roving reporter in Queensland and then Victoria. In 2000 Lyle was elected to Toowoomba City Council. He was re-elected in 2004 and unsuccessfully contested the 2006 Queensland state election. After a short stint as a political adviser in federal politics, Lyle was appointed in 2007 as Chief of Staff at the Australian Christian Lobby, based in Canberra. 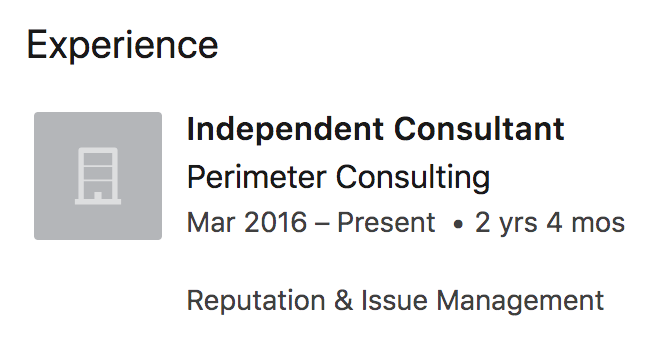 He served in this role for six years before being appointed Managing Director in May 2013. Mr McLellan and his family lived abroad for more than 25 years where he served as the President and CEO of a number of major international corporations. Since returning to Australia, he has been appointed chairman of several public-company boards, principally in the resources area. With a passion for the poor, Mr McLellan served as a director of Opportunity International Australia for many years, and as chairman of Habitat for Humanity Australia. He has also served as chairman of a number of other Christian NGOs. An accomplished public speaker, Tony has addressed audiences in several countries, and has also appeared frequently on American television as a commentator on family issues. Mr McLellan served on the ACL Board for 9 years and as Chairman for the final 6 of those years. On the expiry of his term in November 2015, Mr McLellan was appointed to the honourary position of Chairman Emeritus for his exceptional service to ACL. The Lachlan Macquarie Internship is run by the Lachlan Macquarie Institute, a not for profit company. It is a religious educational program and is neither denominationally nor politically aligned. (Bios also included). The Director reports to a Board. Brigadier (ret.) Jim Wallace AM left the Army as a Brigadier in late 2000 after a 32-year career which included command of the SAS Regiment, Special Forces, and the Army’s mechanised Brigade of 3,000 personnel and most of the Army’s fighting vehicles. He is a graduate of Duntroon in Canberra, the British Army Staff College and the Australian College of Defence and Strategic Studies. Mr Wallace has lived overseas, including in the Middle East. He has also visited Palestinian refugee camps as an unarmed United Nations observer. He is also the former Managing Director of the Australian Christian Lobby, a position he held for 10 years. In 1984 Mr Wallace was made a Member of the Order of Australia for his services to counter-terrorism. He is a Visiting Fellow at the Australian Defence Studies Centre and was appointed by the Minister of Defence to the Council of the Australian Strategic Policy Institute. Mr Wallace and his family worship at the Hughes Baptist Church in Canberra. Mr McLellan and his wife, Rae, recently celebrated 50 years of marriage, and attend St Jude’s Anglican Church in Bowral. David Burr is a lawyer and businessman. Together with his wife May Wan, David has practised law in Melbourne for over 30 years, chiefly in the areas of property and commercial law. He has a strong commitment to social justice and the role of the Church in achieving fundamental human rights for all. David is committed to the work of LMI in developing Christian leaders in public policy. He and May Wan have four adult children, and have attended Full Gospel Assembly Melbourne for almost 20 years. Mark Allaby is a Principal with a major professional services and accounting firm. With over 25 years experience in Europe, North America and Australia, Mr Allaby has worked in an executive capacity across the financial services industry. 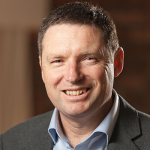 As both a senior partner in the management consulting field, and as corporate senior executive, he has had extensive experience setting strategy, leading organisations through large scale organisational change, and managing risk. Mr Allaby’s commitment to LMI is a result of his passion for the freedoms we enjoy in this country, a nation and society grounded in Christian principles, and a belief that active engagement with the nation through the political process is required to ensure those foundations are not lost in order that our grandchildren may enjoy the same freedoms we take for granted. Mr Allaby and his wife Susan attend St Thomas’ Anglican Church in North Sydney. 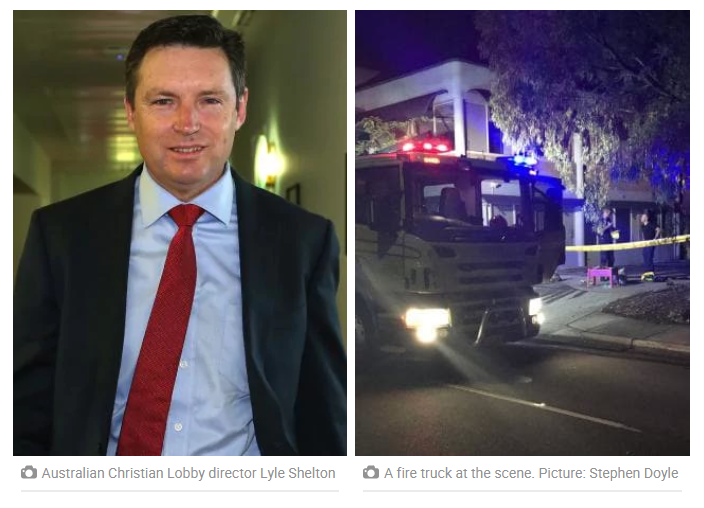 Lyle Shelton is the Managing Director of the Australian Christian Lobby. Lyle is a journalist by profession. He worked in rural journalism as a roving reporter for Queensland Country Life before serving as the Melbourne-based Group Commodities Editor for Rural Press Limited, with articles syndicated to the stable’s rural weeklies, including The Land newspaper. In 1997 he became youth pastor at Toowoomba City Church before being elected to Toowoomba City Council in 2000. He was re-elected to Council in 2004 and unsuccessfully contested the 2006 Queensland state election. After a short stint as a political adviser, Lyle was appointed in 2007 as National Chief of Staff at the Australian Christian Lobby, based in Canberra. He served this role for six years before being appointed Managing Director in May 2013. After graduating with a Bachelor of Arts in Public Policy, Michelle Pearse stepped into the role of WA Director for the Australian Christian Lobby and spokesperson for the fight against prostitution and human trafficking. Michelle and her husband John are both employed at Kingdomcity Perth, a thriving Pentecostal church that is committed to impacting our nation through the love of Christ, socially, economically and politically. Michelle also lectures at Kingdomcity Perth college to give students greater perspective on national issues and encouraging them to be positioned to make a positive impact and create change. Stephen Chavura is a Senior Research Associate at Macquarie University, Sydney. He received his Ph.D. in the history of political thought from the University of New England in 2007. He has published articles in national and international scholarly journals such as History of European Ideas, Journal of Religious History, and Australian Journal of Political Science. His book Tudor Protestant Political Thought 1547-1603 was published in 2007. 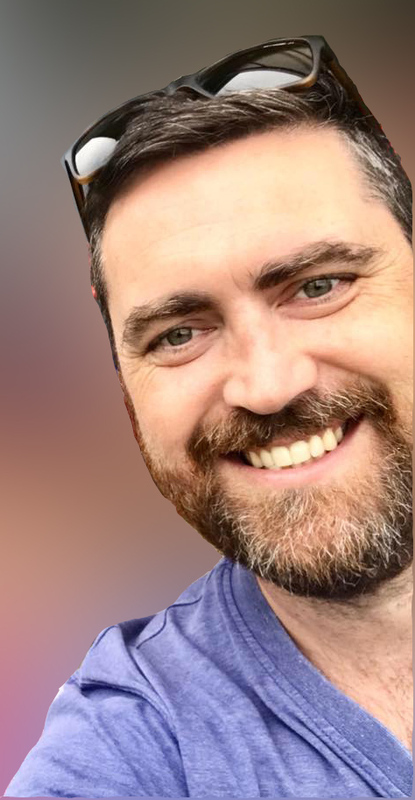 He has taught political theory for the Lachlan Macquarie Internship since 2011 and also teaches Australian history at Campion College, Sydney. He is currently part of an ARC team exploring the emergence and history of the secular state in Australia. Dr. Stephen Chavura, B.A. (Hons. I), Ph.D. (UNE) Senior ARC Research Associate, Macquarie University. MikeyBear: 1. Lyle Shelton: 0. Lyle Shelton, Managing Director of the Australian Christian Lobby (a gay hate group) regularly tells the world gays are not good enough to get married (mainly because he thinks it will make people think he’s gay). He also tells the world children of gay parents are neglected. He also thinks homosexuality is wrong. He has no intelligent justification for these bigoted perspectives. I find that message exceedingly foul. Now when someone sends Lyle a message that he thinks is foul he sticks his fingers in his ears and says “la la la la… I can’t hear you… la la la la…”. @mikeybear is an advocate for changing marriage & he has a substantial Twitter following. His tweets to me are foul. I am blocking him. Today it came to my attention that Prime Minister Julia Gillard is appearing as keynote speaker at the 2012 Australian Christian Lobby National Conference. It also came to my attention that an aligned radical Australian Christian organisation is claiming that “gays reproduce by molesting kids”. Julia, its time to leave the house. 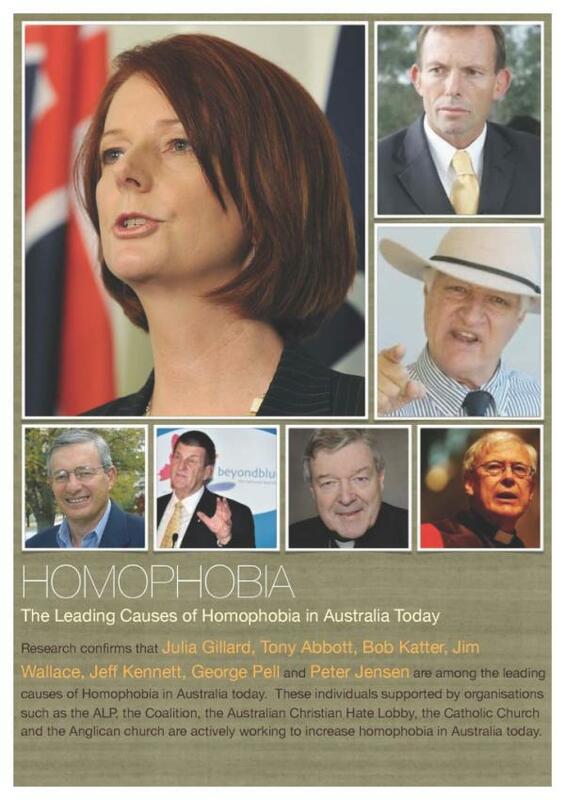 Research confirms that Julia Gillard, Tony Abbott, Bob Katter, Jim Wallace, Jeff Kennett, George Pell and Peter Jensen are among the leading causes of Homophobia in Australia today. These individuals supported by organisations such as the ALP, the Coalition, the Australian Christian Hate Lobby, the Catholic Church and the Anglican Church are actively working to increase homophobia in Australia today.